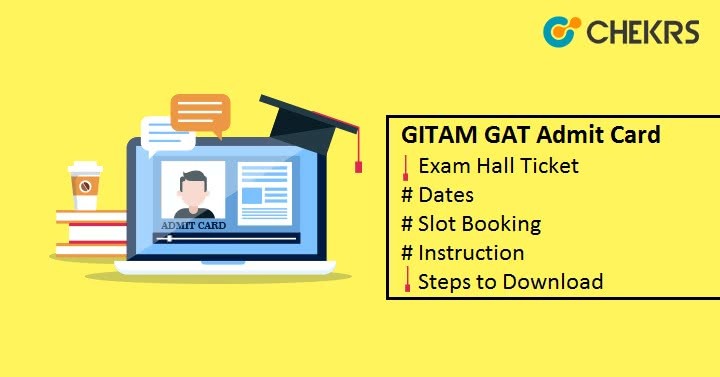 GITAM GAT Admit Card 2019: GITAM GAT is being conducted by GITAM University, Candidates can get admission into its campuses and affiliated colleges through the GITAM GAT Entrance Exam. GITAM GAT Admit card is expected to be available in the month of April 2019. It will be available through online mode only on the official website gitam.edu. Candidates have to carry the admit card to examination center for candidates verification. That’s why we have prepared this post to show you the correct procedure to download GITAM GAT Hall Ticket. GITAM GAT Admit Card is expected to be available in the 1st week of April 2019. But to get it candidates have to do slot booking which will be held just 1 week before the Admit card Availability. To Download Admit Card Candidates have to first complete the GITAM GAT Slot Booking Procedure. Steps are as follows. Candidates have to first visit the official website gitam.edu. Then they have to Log-in to slot booking portal by entering application number, gender, and DOB. After successful log-in, Read the instruction and a new form will appear. Now select an available test center, date and time slot. After selecting the test slot, the candidate needs to submit it. After completing the slot booking procedure. Your Admit Card will appear on the screen. Check the Details and if everything is good, Download it. Also take a Print Out. Candidates will also get email with the GITAM GAT Hall Ticket/ admit card link in Email. So You can also follow that link to access the Admit Card Directly. Candidates have to take a print out of Admit Card. Candidates have to also carry the GITAM GAT Admit Card to the GITAM Gate Examination Center. Make Sure to carry a Photo ID such as Passport, Driving License, EC voter ID card, IT PAN card, School or College photo ID card, Aadhar Card, etc. along with the Admit card. Candidates have to reach 30 minutes before the GATE GAT Exam. I hope, this Article will help you to get GITAM GAT Admit Card 2019 easily. We have also provided here some common instructions and expected dates to make things easier for you. Good Luck, Try Your Best and keep Visiting.